Vijay Crishna, noted Industrialist and theatre personality inaugurates "Tibet Dreams" art installation exhibition of Francis Kodankandath at Jahangir Art Gallery, Mumbai on January 11, 2016. 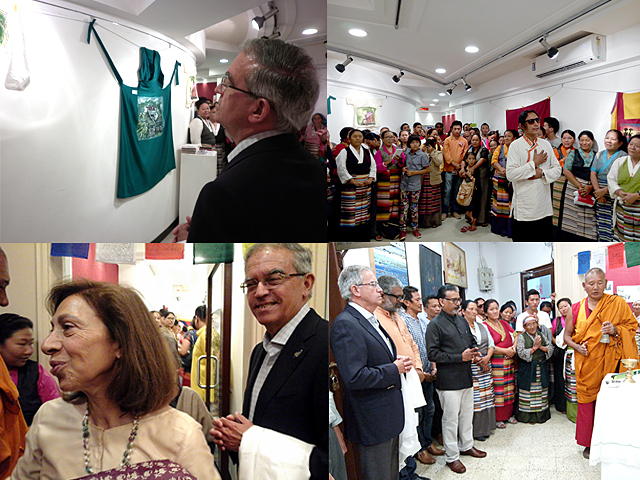 "Tibet Dreams", an exhibition of art installation by contemporary Indian Artist Francis Kodankandath supported by Friends of Tibet was held at Jehangir Art Gallery, Kala Ghoda, Mumbai from January 11-17, 2016. "Tibet Dreams" was conceived in support of Tibet people's solidarity under the leadership of HH the XIV Dalai Lama and their struggle to regain their lost Independence. When the exhibition was conceived Friends of Tibet had a discussion on how to come out of painting canvas and the artist wanted the medium to be an extension of the day to day life of the Tibetan Community. After much thought daily wear of Tibetan community was selected as the medium to express. Used clothes by Tibetans were collected and the artist spent over two months in painting on top of the clothes. The process in itself was unique and took elaborate preparation of white texture and glue to form a base to make the cloth stiff like a canvas. Thus Tibet Dreams was born from the creative mind of Artist Francis Kodankandath. Tibet Dreams was finally installed in late evening of January 10, 2016 at the Jahagir Art Gallery, Mumbai. On January 11, 2016 at 11 am, we opened the hall to an eagerly waiting crowd of art enthusiasts and Tibet supporters. The audience which included the Secretary of the Gallery appreciated the artist for his unique way in taking painting away from canvas and express it in cloth material. The gallery echoed the cause of Tibet with the outlawed Tibetan National Flag displayed with Pride. The Tibetan prayer flags welcomed the guests and audience – school children, office goers, college students, art enthusiasts, artists and general public – experienced life in Tibet. The exhibition was inaugurated by Vijay Crishna, noted Industrialist and theatre personality. Smitha Crishna Godrej, Industrialist and social entrepreneur graced the function. The inaugural ceremony began with Buddhist prayer by a Tibetan monk from Drepung Gomang Monastery. The Chief Guest inaugurated the exhibition by lighting the traditional Tibetan Butter Lamp. Tashi, leader of the Tibetan Community in Mumbai honoured the Chief Guest with a Khata, traditional Tibetan silk scarf. The artist gifted portraits of Vijay Crishna and Smita Godrej he drew for the occasion. Vijay Crishna talked about the plight of Tibetans in their motherland and shared his travel experiences during his various trips to Chinese-occupied Tibet. 1) Artist Francis Kodenkandath recieves the award in 'Works on paper' category at the Florence Biennale, Florence, Italy from Pasquale Celona, one of the jury members. 2) His Holiness the XIV Dalai Lama visits Francis Kodankandath's 'Art of Happiness' art show in Kerala organised by Friends of Tibet. Francis Kodankandath is a long-time supporter of the Tibet Cause and has conducted a series of exhibitions dedicated to the cause. On the 69th birthday of HH the Dalai Lama in 2004, which is also observed as 'World Tibet Day', Friends of Tibet presented the Dalai Lama with "Tibetan Dreams", a piece of art by Francis that brings to life the story of Tibet. On November 25, 2012, His Holiness the Dalai Lama visited Francis Kodankandath's 'Art of Happiness' art show in Kerala organised by Friends of Tibet. And as part of the World Tibet Day 2015, Francis had dedicated and exhibited a painting depicting the outlawed Tibetan National Flag and honouring His Holiness the Dalai Lama on his 80th Birthday. 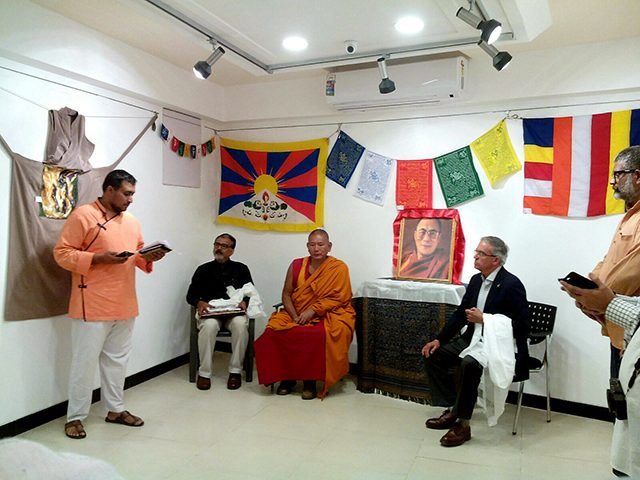 Eswar Anandan, Campaigner, Friends of Tibet recited the Poem 'Tibet Dreams' dedicated to painting exhibition. Now in dreams, now in dreams. This was followed by Tibetan Songs and dance performance which included Tibetan Opera song sung by Yangchen Dolkar, Dolma Tsomo, Sungta Lemo and Karma Gyatso. The exhibition went on to be a huge success. On a daily basis over 200 visitors became aware of the Tibetan cause. It was well attended by renowned artists, theatre personalities, journalists, poets, activists, students, professionals and Tibet Supporters. The unique painting medium drew a lot of applause making the visitors aware about the rich cultural heritage of Tibet and their current plight. Tibetan poet and activist Tenzin Tsundue graced the exhibition and delivered a talk "Tibet in the Era of Globalisation" on Day 5 of the exhibition. 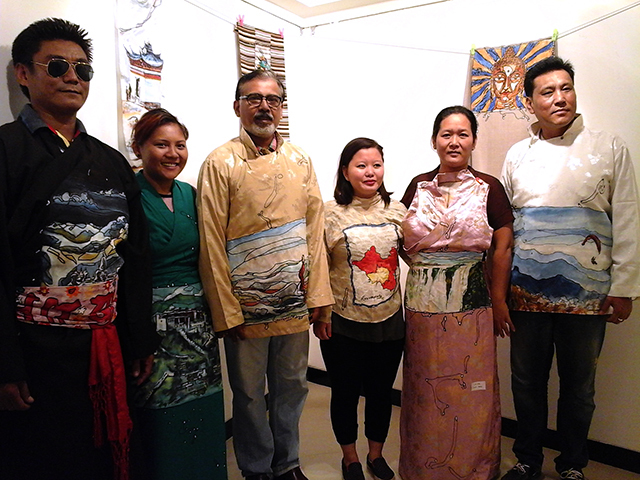 The closing ceremony of "Tibet Dreams" on January 17, 2016 was unique and well-conceived by the artist with members of the Mumbai Tibetan Community wearing the 'Wearable Tibetan Art' which adorned the gallery space. Friends of Tibet, PO Box 16674, Mumbai 400050, India.